For when things get hairy, the Xsight does offer an on-board “Assist” function – think of it as “help”. Whenever an activity doesn’t configure your system correctly, pressing the on-screen [Assist] button will bring up three options: [No Sound], [No Picture] and [Power On/Off]. Pressing any of these will lead to screens with the commands associated with those functions, and allow you to manually correct the situation. The Assist function doesn’t have to be manually configured, and is smart enough to automatically extract the correct power and input commands from manually created Advanced activities. However this button does make itself rather obvious by occupying 2 of the 6 possible positions on the first screen of commands. 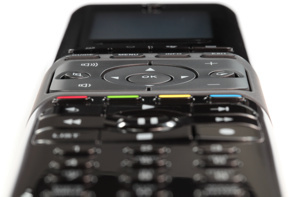 Once recorded, macros can be placed on any hard button or added seemingly randomly amongst the on-screen commands for a particular device. Macros can be easily edited at a later date, with all of them conveniently available from a single list no matter where they were originally assigned on the remote. A home for your channels. The next major feature of the Xsight is “User Profiles” – specifically as they relate to favorite television channels, as the profile concept does not extend to activities, devices or command layouts. 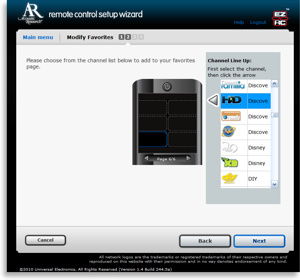 The favorite channel section of the remote can be accessed directly with the [Heart] hard button, or from the Home Menu. Before setting up individual profiles, a master list of favorite channels must be created. 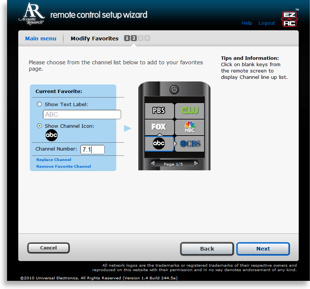 Doing this involves selecting the device that will be used to control channels, and then customizing how it expects numbers to be entered. Afterwards, it’s only a matter of entering in a list of channel numbers and customizing their names and/or representative icons. The wizard offers around 128 stock network icons to pick from, as well as the option to upload your own. A total of 72 channels can be created in this manner. This mass list of channels shows up on the Xsight as the “All Favorites” profile, but to break that down into more manageable chunks you can opt to configure separate “User Profiles”. Each profile (or “category”) can have a unique name, with nine different icons available for further customization. Up to 6 profiles can be created and each can contain a unique mix of channels, but all must be drawn from the same master list created earlier. This does mean that only one source device can ever be used with the Xsight’s favorites section. Each profile or category can have individually customized hard button punchthrough settings, similar to activities; however unlike activities there are no actions associated with entering or exiting one of theses profiles, and no device-specific commands are offered on the LCD screen.